We design and manufacture conveyors for all application. Unit handling, Bulk handling application. We manufacture premium quality of Belt Conveyor which are effective in transporting a variety of products within plants and project sites. The Belt Conveyors are made of superior grade materials which are rugged and sturdy. Our Belt Conveyors can be designed in a variety of belt widths and lengths according to the specific need applications. Being one of the recognized manufacturers, suppliers and exporters in industry, we are engaged in offering a wide range of quality approved Chain Conveyor. 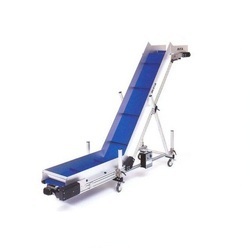 We have made the use of world-class components and latest technologies in manufacturing these Conveyors, which help in making them more qualitative and provide them longevity. Our clientele can avail the facility of timely delivery also. 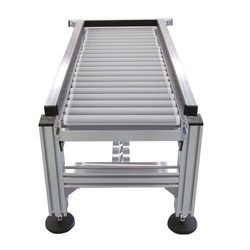 Our range of Slat Conveyor consists one or more of numerous chains to which non overlapping, non-interlocking spaced slats of wood or flanged metal are attached to form a traveling table for the objects to be conveyed for various applications. The width of the Slat Conveyor 100 to 150 mm more than the diagonal length of the largest object to be carried for minimum clearance. Pusher Cleats are provided at regular intervals to facilitate inclined conveying. We are also engaged in manufacturing, supplying and exporting a wide range of Stacker Conveyor. In accordance with the international quality norms, these Conveyor are designed and developed using premium class materials and modern technology methods. 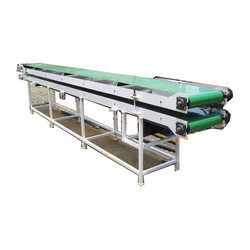 These Conveyor are widely demanded in various industries for their smooth performance, easier operations, less maintenance and longer serving life. We fabricate Screw Conveyor that are efficient in the movement of a wide variety of materials in both horizontal and inclined applications. We offer a broad array of sizes to select from that fit almost all types of applications. 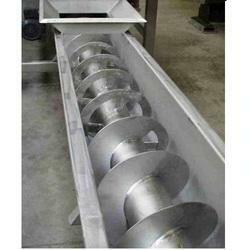 Our Inclined Screw Conveyor are manufactured in superior grades of Steel. 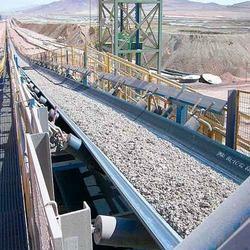 We also manufacture Inclined Belt Conveyor for inclined surfaces. Most of the project sites have a variety of inclinations. In order to reach materials at different levels of height, our inclined belt conveyors come in handy. The Inclined Belt Conveyor are designed to match variations in height and transport materials without any loss. It is also known as Loading & Unloading Conveyor. We manufacture Roller Conveyor which are very efficient in making materials move from one place to another within a facility or project site. We use excellent grade rollers which are characterized by durability and lasting performance. Our Roller Conveyor are fully capable of manufacturing transporting bulk commodities expeditiously. We provide a wide assortment of material handling Bucket Elevator that is widely used in several industries and sectors. These Material Handling Elevators are heavy duty and are capable of bearing heavy loads. These Material Handling Elevators are available in various specifications of standard and customized forms. Moreover, these are quality tested on well defined parameters before being delivered to our clients.